Phytophthora sojae is a devastating pathogen that causes soybean Phytophthora root and stem rot. In this study, we developed seven pairs of polymerase chain reaction primers derived from sequence-characterized amplified regions (SCAR). These seven SCAR markers allowed discrimination of P. sojae from 17 different Phytophthora species and three other soilborne pathogens (Pythium ultimum, Fusarium solani and Rhizoctonia sp.) which also induce root rot in soybean. Among those 17 Phytophthora species, P. melonis has approximately 98% similarity in ITS sequences; P. drechsleri requires an annealing temperature up to 66 °C with an ITS-targeting diagnostic marker (PS primers) developed by Wang et al. (2006) for P. sojae; and P. sansomeana is a newly described soybean-infecting Phytophthora species. These three Phytophthora species could be specifically distinguished against P. sojae by these seven SCAR markers. After screening 100 random amplified polymorphic DNA (RAPD) primers, eight primers clearly produced specific bands only for P. sojae rather than other Phytophthora species tested. Subsequently, seven of eight P. sojae-specific RAPD markers were successfully converted into SCAR markers, namely, Scar276, Scar304, Scar333, Scar37, Scar519, Scar57 and Scar78. These SCAR markers were used to detect 75 isolates of P. sojae specifically, while no products were obtained for 29 additional isolates representing 17 other Phytophthora species and three other soilborne pathogens. Furthermore, Scar333 successfully allowed the detection with a sensitivity of 100 pg from genomic DNA of P. sojae, Scar276 had a higher sensitivity of 10 pg, and four specific SCAR primers (Scar304, Scar37, Scar519 and Scar78) had a sensitivity of 100 fg, which is the highest for detecting P. sojae until now. Six of the seven SCAR markers, with the exception of Scar57, were also used to detected P. sojae in artificial or naturally infected soybean seedlings and infested soil. 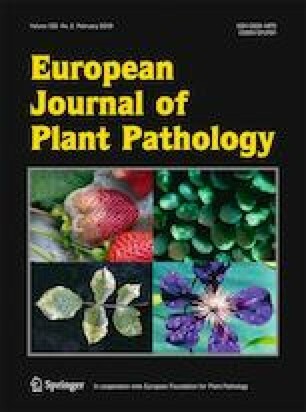 Our findings demonstrate that SCAR markers provide a rapid and sensitive molecular diagnostic tool for the detection of P. sojae in plants, and will play a key role in effective management of the disease. Qin Xiong and Jing Xu contributed equally to this work. The online version of this article ( https://doi.org/10.1007/s10658-018-1579-4) contains supplementary material, which is available to authorized users. This research was partly supported by grants provided to Qin Xiong by the National Natural Science Foundation of China (No. 31600512) and the Natural Science Foundation of Jiangsu Province (BK20160923), to Yuanchao Wang by Special Fund for Agro-scientific Research in the Public Interest (201303018), to Chen Zhang, Yu Zhu and Xinyue Zheng by Students Practice Innovation and Training Program of Nanjing Forestry University (201710298045Z, 201710298064Z, 2016NFUSPITP206) respectively, and by the Priority Academic Program Development of Jiangsu Higher Education Institutions. The authors declare that they have no conflict of interest. We highly appreciate W. H. Ko (Hawaii University), Brett Tyler (Oregon State University), J. H. Peng (Dalian Quarantine Bureau) and Q. H. Tang (Nanjing Agricultural University) for providing us with the isolates of Phytophthora spp. and other pathogens. We also thank James T. Wong (University of California Riverside), Peng Wang (University of California Riverside), Justin Waletich (Oregon State University) and Kai Tao (Oregon State University) for their editorial assistance.